Journalists want companies to actively send out their current and industry-relevant news. This is the main result that came out from the international journalist survey conducted by Liana Technologies in December 2017. The survey asked journalists and media professionals which factors affect whether or not they’ll read and publish a press release. Liana Technologies conducted the survey in December 2017 and got a total of 618 responses from Europe, Asia and the Middle East. 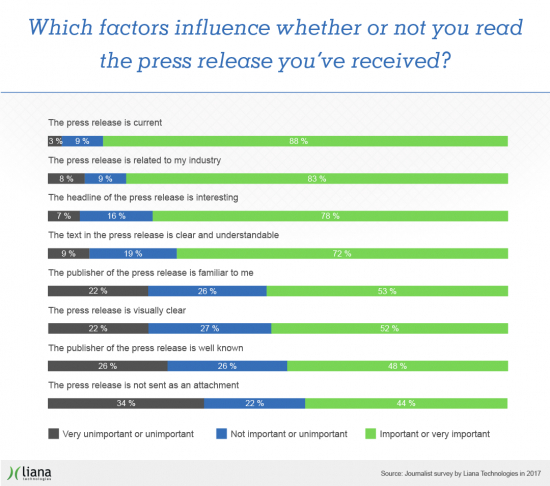 The purpose of the survey was to find out which factors affect that a press releases will be noticed by the journalists and published in media. According to the survey results, being active is the most important thing to get media coverage. Almost 90% of the respondents said they want companies and organizations to send out press releases regularly, even though they can’t always be utilized. However, being active alone is not enough. A rough 90% of the journalists also expect the content to be very fresh and current, while 83% of them said they only read the release if it’s related to the industry or topics they cover. Having a compelling and catchy headline is also important, because over two-thirds of the respondents decide whether to read the whole release based on that. The survey also revealed the popularity of social media as media channel. Social media is used by 72% of the respondents for following interesting topics and by 65% for searching them. 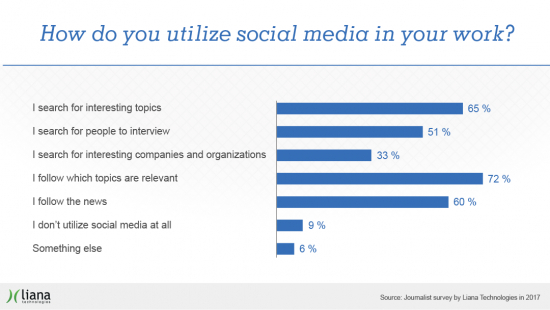 The most important channel for journalists is Facebook followed by 52% of the respondents. Twitter comes second with 37% and a third of the journalists follow blogs. “PR has spread from traditional print and online medias to social media channels. With more digital channels to handle, the technology partner becomes has a huge impact on the success in media communications. Agile tools enable omnichannel PR by making it easy to share releases in multiple channels and helps targeting them precisely. This makes media communications more efficient and helps companies to build long-term media relations and visibility”, tells Jonna Seppänen. Liana Technologies is a marketing and communications software company that develops and sells Marketing Cloud and PR Cloud services for corporate use. Its headquarters is located in Oulu, Finland sales offices in Helsinki, Stockholm, Hamburg, Munich, Paris, Dubai and Hong Kong. Liana Technologies is a fast growing company with over 3,500 corporate customers. For the past eight years the company has been ranked on the Deloitte Technology Fast 50 Finland list and is one of the national finalists for the European Business Awards 2017/2018. Liana Technologies is a privately held company founded in 2005.